Submit through Grants.gov by 11:59 p.m. U.S. Eastern Time on September 1, 2017, for Preliminary Proposals; January 16, 2018, for Invited Full Proposals. Not earlier than May 1, 2018. Projects must begin on May 1, June 1, or July 1, 2018. A1. What is this grant program? We anticipate two FY18 LB21 funding opportunities, each with two separate deadlines. In addition to the opportunity described in this Notice of Funding Opportunity, a separate LB21 funding opportunity is anticipated to be announced in December 2017 with a preliminary proposal application submission due date in February 2018. Both opportunities are subject to the availability of funds and IMLS discretion and procedures. A2. What are indicators of successful projects? Broad impact: Your proposal should address key needs, high priority gaps, and challenges that face libraries or archives. It should expand the boundaries within which libraries and archives operate, show the potential for far-reaching impact, influence theory and practice, and build upon current strategic initiatives and agendas in these fields. Advancement of library theory or practice: Your proposal should demonstrate a thorough understanding of current theory or practice and show how the project has the potential to strengthen and improve services to benefit the communities being served. Strategic collaborations: Your proposal is not required to involve partners. However, partnerships can demonstrate a broad need, field-wide buy-in and input, access to appropriate expertise, sharing of resources, or sustainability. A3. What are the IMLS agency-level goals? IMLS places importance on diversity and inclusion. This may be reflected in a project in a wide range of ways, including efforts to serve: individuals of diverse geographic, cultural, and socioeconomic backgrounds; persons with disabilities; persons with limited functional literacy or information skills; individuals having difficulty using a library or museum; underserved urban and rural communities; and children from families with incomes below the poverty level. This may also be reflected in efforts to recruit future professionals in the library or museum fields as well as strategies in building or enhancing access to collections and information. A4. What are the funding and project categories and project types? Your application must designate one of these four funding categories. You may submit as many applications as you wish; however, the same proposal may not be submitted to IMLS under more than one category. Please note: proposals that address challenges faced by the library and archives fields, but do not focus on education and training of librarians, should be submitted to the National Leadership Grants for Libraries program. Planning Grants allow project teams to perform preliminary planning activities, such as analyzing needs and feasibility, solidifying partnerships, developing project work plans, or developing prototypes, or proofs of concept, and pilot studies. Assessing the outcomes of planning activities should be appropriate to this early stage of work. Applications are expected to provide a basic framework for planning activities that have the potential to lead to a future project. Planning Grants are for periods of one year. National Forum Grants provide the opportunity to convene qualified groups of experts and key stakeholders, including those from adjacent fields as appropriate, with the purpose of fostering discussion and consideration of nationally important professional development and education-related issues among libraries and archives across the nation. National Forum grant recipients are expected to produce reports for wide dissemination with expert opinions for action or research that address key challenge(s) identified in the proposal. Additional mechanisms for engaging stakeholders and building awareness of the findings are encouraged. National Forum Grants are for periods of one to two years. Project Grants support projects to develop faculty and library leaders, recruit and educate the next generation of librarians and archivists, and assist in the professional development of library and archives staff. It is essential that projects have clear potential for broad impact. Projects may scale or further evolve an earlier phase of work, but should not simply sustain an existing project. Project Grants are for periods of one to three years. Doctoral level programs may carry out project activities for one to four years. Research Grants involve the investigation of key questions important to the library or information science professions. Basic and applied research projects should build upon prior empirical or theoretical work in libraries and archives or other fields, such as anthropology, learning sciences, sociology, etc., as appropriate. Research proposals should include clearly articulated research questions; feature data collection and analysis methods that help the project team answer their questions; and include dissemination strategies that allow the research team to share broadly the research findings and implications of the findings for libraries and archives. Proposals for Research Grants may apply to any of the Project Types listed below: Pre-professional, Master’s-level and Doctoral-level Programs, Early Career Development, and Continuing Education. See Guidance for Research Applications [internal doclet link]. Research Grants are for periods of one to three years. A4b. What are the project categories? Your application must designate one of these three project categories. You may submit as many applications as you wish; however, the same proposal may not be submitted to IMLS under more than one category. Below is detailed information about what is expected in each project category area. Developing knowledge, skills, and competencies to identify community opportunities, address community needs, provide community-based programs, establish or deepen strategic relationships, and enhance services that support and engage the community. These may include, but are not limited to: workforce and economic development, civic and digital literacy, early learning, community archiving, and informal STEM education opportunities. Integrating into theory and practice approaches and techniques including, but not limited to: design thinking, data analytics, impact assessment, leadership development, organizational change, learning sciences, asset mapping, and collective impact (see IMLS Community Catalyst and Community Salute Initiatives). Designing and developing new and potentially replicable participatory library programming models that engage communities and provide learning experiences for library users across the lifespan, with focus on underserved communities. Possible audiences might include, but are not limited to, young children and their families/caregivers; tweens and teens; un- and underemployed adults; veterans; immigrants and refugees; people with disabilities; English language learners; and senior citizens. Investigating widespread community and institutional challenges that both inform and are informed by current and evolving library and related practice, feature mutually beneficial relationships between researchers, practitioners, and the communities they serve. Assessment of impact using community-based indicators (both qualitative and quantitative) and draw upon trends identified in publicly available data. Project findings should be communicated in ways that have the potential to improve library services. Planning, implementing, or improving training or education programs for librarians or library students related to the development, implementation, or use of digital library tools and implementation of digital library infrastructure. Assessing the needs for and impact of investments in education and training for open source digital library tools. For example, proposed projects may examine librarians’ education and training needs for coding or other skills, or employers’ desired competencies for digital library professionals; or adoption of existing tools that might support libraries’ engagement in Open Educational Resources (OER). Planning for training library school students or library staff on topics related to preservation, conservation, and access. In particular, training should address the stewardship of digital collections and, as appropriate, their synergy with physical collections. Identifying an emerging area of importance for librarian skill development as related to the stewardship of digital collections, and bringing together stakeholders from both inside and outside the library sector to explore the topic. These projects should initiate new partnerships to increase the capacity of librarians to meet library workforce needs. This may involve working with non-traditional partners from the business or community development sectors. Supporting formal or informal educational programs to increase librarians’ capacity related to the stewardship of digital collections including community based digital archiving. These projects should clearly demonstrate that they build on existing work, are grounded in the needs of a wide range of libraries and archives, and that they involve a range of partners. Assessing the gaps in, needs for, and impact of investments in education and training products, services, and networks to support stewardship of digital collections across a range of institutions. A4c. What are the project types? Your application must designate one of the following four project types on the Program Information Sheet. The same proposal may not be submitted to IMLS under more than one project type. Note: If your application has a recruitment component, you should address ways to bring to the profession skills required to enhance library and/or archives services and broaden participation in the library profession, including members of diverse groups and communities. Projects focused on developing a diverse workforce of librarians are encouraged. Pre-Professional proposals support the development of a diverse workforce in library and information science by introducing middle school, high school, community college, or undergraduate students to explore careers in library and information science through statewide, regional, or national recruitment and part-time employment. Mentorship and service learning may be key components of projects in this category. Master’s Programs educate the next generation of librarians and archivists in nationally accredited graduate library programs to meet the evolving needs of the profession and society. Doctoral Programs develop faculty to educate the next generation of library and archives professionals. These programs should develop library and archives leaders to assume positions as managers, administrators, researchers, and faculty. Doctoral-level programs may carry out project activities for up to four years. See Section A4e for additional eligibility criteria related to this project type. Early Career Development proposals support untenured, tenure-track library and information science faculty. Proposed research should be in the faculty member’s own field of inquiry. Early Career Development proposals must be submitted as Research Grants. See Section A.4e for additional eligibility criteria related to this project type. Continuing Education proposals aim to improve the knowledge, skills, and abilities of library and archives professionals through formal and informal programs such as: post-master’s programs, residencies, internships, enhanced work experiences, blended learning opportunities including mentorships, online learning modules, and other training programs for professional staff. A4d. Where can I find additional examples of projects funded by this program? A4e. Are there special eligibility conditions for specific project types? Yes, some project types have special eligibility conditions, as outlined below. Note, all eligible entities may apply, either individually or collaboratively, to the Pre-Professional and Continuing Education project types. Only graduate schools of library and information science offering programs of study at the doctoral level are eligible to apply for funding of doctoral level scholarships and fellowships, either individually or collaboratively. Graduate schools of library and information science and graduate schools that provide school library media certification programs are eligible to apply for funds to educate students at the master's level only if they apply in a collaboration that includes one or more eligible library entities. Any of the eligible applicants in the collaboration may serve as the lead applicant. Projects must have a single project director with no co-project directors. Consultants and students may be included in the project. Only tenure-track, untenured library and information science faculty (by the deadline for submission of Invited Full Proposals) are eligible to serve as project directors. The project director must hold a doctoral degree (by the deadline for submission of Invited Full Proposals). The project director must have both educational and research responsibilities (by the deadline for submission of Invited Full Proposals). A letter of departmental endorsement, including verification of project director eligibility, must be included in the Invited Full Proposal (if invited to submit an Invited Full Proposal). Note that there are also funding restrictions that could affect the eligibility of a project; please consult Section D7 below for details. A5. Where can I find the authorizing statute and regulations for this funding opportunity? Statute: 20 U.S.C. § 9101 et seq. ; in particular, § 9165 (Laura Bush 21st Century Librarian Program grants). Note: You are required to follow the IMLS regulations that are in effect at the time of the award. Note: The Office of Management and Budget (OMB) guidance on Uniform Administrative Requirements, Cost Principles, and Audit Requirements for Federal Awards (Uniform Guidance) can be found at 2 C.F.R. pt. 200. With certain IMLS-specific additions, IMLS regulations at 2 C.F.R. pt. 3187 formally adopt the 2 C.F.R. pt. 200 Uniform Guidance. May 1, 2018–June 30 2022. Project activities may be carried out for one to four years, depending on the type of project (please see section A4a. above). Applications for renewal or supplementation of existing projects are not eligible to compete with applications for new awards. C1. What are the eligibility requirements for this program? To be eligible for LB21, you must be either a unit of State or local government or a private nonprofit organization that has tax-exempt status under the Internal Revenue Code and be located in one of the 50 States of the United States of America, the District of Columbia, the Commonwealth of Puerto Rico, Guam, American Samoa, the U.S. Virgin Islands, the Commonwealth of the Northern Mariana Islands, the Republic of the Marshall Islands, the Federated States of Micronesia, or the Republic of Palau. Private or special libraries that have been deemed eligible to participate in this program by the State in which the library is located. We recognize the potential for valuable contributions to the overall goals of the LB21 program by entities that do not meet the eligibility requirements above. Although such entities may not serve as the official applicants, they are encouraged to participate in projects. Federally operated libraries and museums may not apply for LB21 grants, but they may participate with applicants. Contact us before submitting a proposal involving a federal agency or federal collection. Non-Federal entities may serve as subrecipients or contractors and may receive IMLS grant funds as a result of the project. Consult with us about any eligibility questions before submitting an application. Note: Please consult Section D below to see if there is any documentation that must be submitted to support an eligibility determination (for example, proof of private, nonprofit institution status as determined by the Internal Revenue Service). Note that there are also funding restrictions that could affect the eligibility of a project; please consult Section D6 below for details. C2. What are the cost-sharing requirements for this program? C3a. How many applications can we submit under this announcement? An applicant organization may submit multiple applications under this announcement. Individual project directors may be named on multiple applications under this announcement. However, the same proposal may not be submitted to IMLS under more than one funding category listed in A3a above. Generally, single institutions will receive only 1-2 grants per program during any one cycle. C3b. What if our organization fails to meet an eligibility criterion by the time of the application deadline? C3c. What if our organization fails to meet an eligibility criterion at the time of award? IMLS will not make awards to ineligible applicants. In order to receive an IMLS award, you must be eligible, be in compliance with applicable requirements, and be in good standing on all active IMLS awards. The application process for the LB21 program is a two phase process. In the first phase (Preliminary Proposal phase), all applicants must submit a two page preliminary proposal by the deadline listed above. Selected applicants will be invited to submit full proposals in the second phase of the process (Invited Full Proposal phase). Only invited full proposals will be considered for funding. D1. How can we find the application package? D1a. Can we request an audio recording of this announcement? D1b. Can we request a paper copy of this announcement? Upon request, we will provide a paper copy of this publication. Call 202-653-4700. D1c. What content and form is required to make a complete application? The application process for the LB21 program has two phases. In the first phase, all applicants must submit a two-page preliminary proposal (Part I: Components of Preliminary Proposals) by the deadline. Selected applicants will be invited to submit full proposals (Part II: Components of Invited Full Proposals) in the second phase of the process. Only invited full proposals will be considered for funding. D2. What content and form is required to make a complete application for Part I (Preliminary Proposal)? The Table of Application Components below will help you prepare a complete Preliminary Proposal application. You will find links to more information and instructions for each application component in the table. Applications missing any Required Documents or Conditionally Required Documents from this list will be considered incomplete and will be rejected from further consideration. How should we format, name, and sequence the application components? Document format: Aside from the SF-424S, which is created in Grants.gov, all application components must be submitted as PDF documents. Page limits: Note page limits listed in the table above. We will remove any pages over the limit, and we will not send them to reviewers as part of your application. Naming convention: Use the naming conventions indicated in the table above. IMPORTANT: You are limited to using the following characters in all attachment file names: A-Z, a-z, 0-9, underscore (_), hyphen (-), space, period. If you use any other characters when naming your attachment files, your application will be rejected. Note: Each document you create must be converted to a PDF before you submit it. Download and complete the IMLS Program Information Sheet (PDF, 1.4 MB). See Appendix One for a copy of the IMLS Program Information Sheet. Instructions for preparation are in the next section. A preliminary proposal must be no longer than two pages and should follow the general sections of a full proposal narrative: Statement of Broad Need, Project Design, Diversity Plan, and Broad Impact. Briefly describe the need for the project and its relevance to a project category, then lay out the project’s proposed work plan and projected impact, including specific performance goals and outcomes. You must conclude the preliminary proposal with a budget summary. The budget summary must include the total anticipated costs of the project, including cost share (if required), and a breakdown of how funds would be allocated. Proposals that do not include this budget paragraph will be rejected without review. Save this document as a PDF. Make sure your organization’s name appears at the top of each page. Use at least 0.5-inch margins on all sides and a font size of at least twelve points. Include a project title at the top of the first page. In the first few sentences of the Preliminary Proposal, provide a proposal summary that includes the: name of the lead applicant organization; amount of IMLS funds requested and amount of funds provided as cost share (if required); partner organizations; and main question, objective, or anticipated result of the project. If your proposal is selected for funding, the Preliminary Proposal Narrative may be published by IMLS online. As such, it must not include any sensitive proprietary, or confidential information. D2d. Whom should I contact if I have questions while developing my proposal? Prior to submitting a preliminary proposal, applicants are encouraged to contact IMLS program officers who can offer general information about the Notice of Funding Opportunity and the review process. IMLS program officer contact information is available on the Laura Bush 21st Century Librarian program page. D3. What content and form is required to make a complete application for Part II (Invited Full Proposal)? If you are invited to submit a Full Proposal you must submit a complete application by 11:59 p.m. U.S. Eastern Time on January 16, 2018. We make grants only to eligible applicants that submit complete Full Proposal applications through Grants.gov, on or before this deadline. Complete applications will be accepted only from applicants who have submitted Preliminary Proposals and have been invited to submit a Full Proposal. D3b. How should we format, name, and sequence the application components? Naming convention: Use the naming conventions indicated in the table above. IMPORTANT: You are limited to using the following characters in all attachment file names: A-Z, a-z, 0-9, underscore (_), hyphen (-), space, period. If you use any other characters when naming your attachment files, your application may be rejected. Write this one-page document and save it as a PDF. Who is the lead applicant and, if applicable, who are the collaborators? What do you plan to accomplish and why? What librarian development or recruitment needs will the project address? Who is the intended audience for the activities? What will be the specific project activities, performance goals, outcomes, results, and tangible products? What are the intended outcomes for audience members in terms of measurable changes in knowledge, attitudes, or behavior? This Abstract may be used for public information purposes, so it should be written for experts as well as a general audience. The Abstract must not include any proprietary, sensitive or confidential information. Download and complete the IMLS Program Information Sheet (PDF, 1.4 MB). Click here for instructions on completing the IMLS Program Information Sheet. See Appendix Four for a copy of the IMLS Program Information Sheet. Create a one-page Organizational Profile and save it as a PDF. Click here for instructions on creating an Organizational Profile. Structure your Narrative according to the following outline, using the four section titles and addressing the bullet points beneath them. Address the sections of the Narrative separately and in the same order in which they are listed below. In each section, be mindful of the characteristics of successful LB21 projects in the areas of broad impact, advancement of library theory or practice, and strategic collaborations; refer to Section A2 for more information on indicators of successful projects. Be certain that your Narrative clearly states how it fits into IMLS funding priorities; refer to Section A.3 for more information on IMLS agency-level goals. Limit the Narrative to ten single-spaced, numbered pages. We will remove any pages above the ten-page limit and we will not send them to reviewers as part of your application. Make sure your organization's name appears at the top of each page. Use at least 0.5-inch margins on all sides and a font size of at least twelve points. Use Supporting Documents to provide supplementary material. Please be advised that reviewers may also choose to visit your organization's website, as listed on the SF-424S form provided with your application. If your proposed project is selected for funding, the Full Proposal Narrative may be published by IMLS online. As such, it must not include any sensitive, proprietary or confidential information. What field-wide need or challenge does your proposal address? Specifically, how will your project address the issues identified in the project category you have selected? Does the proposal provide evidence of potential for broad significance in the library and archives fields by addressing a need or challenge of interest or concern to the library and archives fields? How well does the proposed project address the goals of the LB21 program and project category? Who will benefit from the project? How have you identified or assessed the challenges or needs of this audience or participants? Are potential beneficiaries well described and appropriate for this grant program? Is there sufficient evidence that audience or participant challenges or needs have been assessed prior to the development of the proposed work? How does this proposed project differ from, complement, or build upon theory, scholarship, and practice in this area? Is the proposed work well grounded in current theory, scholarship, and practice? For Early Career Development applicants: describe how this work fits within your long-term research agenda. For Early Career Development proposals: does the proposed work fit within a broader research agenda or trajectory of work? What are the goals, projected outcomes, and assumptions of your project? Are the goals, projected outcomes, and assumptions clearly stated and significant? Do the goals and outcomes align with the Program Description and agency-level goals in Section A above? What are the potential risks to the project and are they accounted for in the work plan? Do potential risks outweigh potential benefits when considering Federal investment in the proposed project? How is success for the project or activity defined? Does the definition of success address the need and will the evaluation approach indicate whether or not they achieved success? Do the project team members have the necessary expertise, background, and capacity to successfully plan, implement, and manage the proposed work? When and in what sequence will activities occur? Will the activities achieve the listed outcomes and goals? Is the schedule of work realistic and achievable? Is a clear plan described for tracking the project's progress and adjusting course when necessary? If applicable, how will coursework or training content be made available to the specified audience? How will coursework or training content be adapted and disseminated? Is a plan clearly described for adapting and disseminating any curriculum, training modules, or other findings? What time, personnel, financial, and other resources will you need to carry out the activities? Are the identified time, personnel, and financial, and other resources appropriate for the scope and scale of the project? How will you track your progress toward achieving projected goals and intended outcomes? How will you include evaluation and performance measurement in your plan? Are clear methods described for tracking the project's progress and adjusting course when necessary? Are the proposed evaluation activities and performance measurements appropriate for the project? Will project activities result in informative findings? How and with whom will you share your project findings? How will results of the project be made available? Is there an effective plan for communicating results and sharing findings in a manner that has potential for field-wide reach and impact? How does the project design allow for input, consensus building, and buy-in from others in or outside the field? Are methods or modes of supporting input, consensus building, and buy-in from others thoughtfully considered and addressed by the project team? How are project activities informed by appropriate theory and practice? Are the proposed activities well informed by appropriate theory and practice? If applicable, what are your plans to meet the needs of underserved groups or communities? If applicable, are plans to meet the needs of underserved groups or communities clearly articulated and realistic? What is your research question(s)? Who, if anyone, will help you answer your questions? How? What is your theoretical or conceptual framework? How will you collect data? What kind of data will you collect? How will you analyze it? If applicable, who are your participants? Describe them. How will you share and translate research findings for practitioners? See also Guidance for Research Applications for further information. Does the proposal include research questions? If so, are the questions of significant interest to the library and archives fields? Are articulated research methods adequate and appropriate to answer the research questions? Is there enough information about potential participants? If not, what information is need? Is the dissemination and communication plan comprehensive in terms of broad reach to researchers, practitioners and/or other communities of interest? What are the diverse groups or communities that will be engaged in this project, and how were these populations chosen? Is enough information provided about the groups or communities that will be engaged in the project and how they were chosen? If not, what information is missing? What are the unique needs of the populations that will be engaged in this project? Does the project team appear to have adequately and appropriately considered and described the needs of the populations to be engaged? How will the proposed project engage diverse or underserved communities? How will the proposed project support the development of a diverse workforce of librarians and archivists? Does the applicant demonstrate capacity to engage the identified diverse or underserved communities? Does it appear that the proposed activities will appropriately serve the needs of diverse or underserved communities and work to develop a diverse workforce of librarians and archivists? Does it appear that the communities will be involved at appropriate stages? Are there mechanisms within the plan to achieve the project outcomes? If applicable, how will the project build greater skills and abilities in the library and archives workforce? Is the project plan solidly grounded and appropriately structured to achieve the goal of building greater skills in library professionals and meet the needs of today's library and archives workforces? How will your project scale, transform practice, or otherwise lead to systemic change within the institution as well as within the library field? Does the proposal make a compelling case for how it can scale, transform practice, or otherwise lead to systemic change within the institution as well as within the library field? What are the findings or products from this project that will benefit multiple institutions and diverse audiences? Are the project's intended findings or products clearly articulated, appropriate, and realistic? Will the proposed project generate results that can extend beyond a single institution to benefit multiple institutions and diverse audiences? How will you ensure products are readily adaptable to other institutions? Does the proposal adequately describe how it will ensure products will be readily adaptable to other institutions? Referring to the Performance Goal and Performance Measure Statement(s) selected on the Program Information Sheet, how will you collect and report the corresponding data? Does the proposal plan to collect performance measurements? What are the benchmarks for the project’s performance measures? How will you measure success with these benchmarks? Does the proposal provide an appropriate plan for measuring success? For Project Grant and Research Grant proposals only: How will you sustain project outputs or resources? Is there a well-grounded and practical plan for sustaining the outputs or resources of the project beyond the conclusion of the award? If applicable, does the proposal include plans for preserving and maintaining digital content beyond the grant period? If appropriate, how will new or improved workforce skills be measured? If appropriate, are the plans to measure new or improved skills compelling? Download and complete the current IMLS Budget Form (PDF, 110 KB). Click here for instructions on completing the budget form. Java Script must be enabled. Write a one-page list of staff and consultants whose expertise is essential to the success of the project and save it as a PDF. Do not list the entire staff involved in the project. If you cannot identify key project staff by the application deadline, then list the position title instead. This list must include the Project Director listed in Item 7 of the SF-424S. Provide resumes of no more than two pages each, as a PDF, for every key project staff member and key consultant identified on the List of Key Project Staff and Consultants described above. If you cannot identify key project staff by the application deadline, then submit position descriptions instead. A position description does not identify a specific individual; it identifies the qualities and range of experience and education necessary to successfully implement and complete project activities. IMLS defines digital products very broadly (digital content, resources, assets, software, or datasets). You should review all of the questions in the Digital Product form to determine if your proposal contains any digital products. If your application is not creating ANY digital products, please check the box indicating no products at the beginning of the form. If you are creating digital products, you must complete the Digital Product Form by providing for each section the corresponding information or marking “Not applicable for this project” in each respective section. In any event, your application will be considered incomplete if it does not include a completed Digital Product Form. Click here for Guidance for Projects that Develop Digital Products. If either of the situations below (nonprofit status or federally negotiated indirect cost rate) applies for your proposal, you must submit the appropriate documents. Failure to provide a conditionally required document will result in your application being considered incomplete and rejected from further consideration. If you are applying as a private, nonprofit institution, you must submit a copy of the letter from the Internal Revenue Service indicating your eligibility for nonprofit status under the applicable provision of the Internal Revenue Code of 1954, as amended. We will not accept a letter of state sales tax exemption as proof of nonprofit status. Note: If you are eligible for and are choosing the option of claiming an indirect cost rate of 10 percent of modified total direct costs (see 2 C.F.R. part 200, including 2 C.F.R. sections 200.68, 200.414(f), and 200.510(b)(6)), you do not need to provide any documentation. Click here for further information on indirect costs. D4. What are the registration requirements for submitting an application? D4a. What is a D-U-N-S® number and how do we get one? D4b. What is the System for Award Management (SAM.gov) and how do we register? SAM.gov is the official U.S. government system that consolidated the capabilities of previous registration systems such as CCR/FedReg, ORCA, and EPLS. There is no fee to register with SAM.gov. Click here to learn more about SAM.gov registration. D4c. What is Grants.gov and how do we register? Grants.gov is the centralized location for grant seekers to find and apply for Federal funding opportunities. You must submit your application through Grants.gov. You must register with Grants.gov prior to submitting your application package. The multi-step registration process generally cannot be completed in a single day. If you are not already registered, you should allow at least two weeks to complete this one-time process. Do not wait until the day of the application deadline to register. You do not need to complete the registration process to download the application package and begin to prepare your materials. However, you will need your Grants.gov user ID and password that you obtain during the registration process to submit your application when it is complete. D5. When and how must we submit our application? You must submit your application through Grants.gov. Do not submit through email to IMLS. For the Laura Bush 21st Century Librarian Program, Grants.gov will accept applications through 11:59 p.m. U.S. Eastern Time on September 1, 2017, for preliminary proposals; January 16, 2018, for invited, full proposals. D5a. What happens after we submit our application through Grants.gov? Within two business days of receiving your submission, Grants.gov will generate two emails regarding the progress of your application through the system. The first email will confirm receipt of your application by the Grants.gov system and the second will indicate that the application has either been successfully validated by the system prior to transmission to the grantor agency (IMLS) or has been rejected due to errors. After the official grant program deadline, you will receive a third email confirming that IMLS has retrieved your application. Until that point, you can check the status of your application(s) in Grants.gov by using the “Track My Application” feature. For further details, please consult Grants.gov. D6. Is there an intergovernmental review? D7. Are there funding restrictions? Note: If you have questions about whether specific activities are allowable, call IMLS staff for guidance. D7a. How do we include costs for third parties? D7b. What are our options for including indirect costs in our budget? E1. What are the review criteria? Reviewers are instructed to evaluate applications according to the review criteria included within the Narrative instructions in Section D.2 of this document. Reviewers consider all Required and Conditionally Required, and Supporting Documents, as listed in Section D.2. E1a. Is cost sharing considered in the review process? Cost sharing is an eligibility criterion and is not considered in the review of applications. Cost sharing is not required for Research Grants. Cost sharing requirements for this grant program are addressed in Section C.2. E2. What is the review and selection process? We use a peer review process to evaluate all eligible and complete applications. Reviewers are professionals in the field with relevant knowledge and expertise in the types of project activities identified in the applications. We instruct reviewers to evaluate applications according to the review criteria. Reviewer conflicts of interest are identified prior to review, and it is intended that reviewers who may have conflicts with particular applications are reassigned to review other applications. The Director takes into account the input provided by the review process and makes final funding decisions consistent with the purposes of the agency’s mission and programs. E3. What is the designated integrity and performance system and how does IMLS comply with its requirements? E4. When will we be notified of funding decisions? We will not release information about the status of an application until the applications have been reviewed and all deliberations are concluded. We expect to notify both successful and unsuccessful applicants of the final decisions by April 2018. F1. How will we be notified of funding decisions? We will notify both successful and unsuccessful applicants of funding decisions by email. Your period of performance will be included on your Official Award Notification for Grants and Cooperative Agreements. The award period of performance begins on the first day of the month in which project activities start and ends on the last day of the month in which these activities are completed. Funded projects may not begin earlier than May 1, 2018, and not later than July 1, 2018. F2. What are the administrative and national policy requirements? Organizations that receive IMLS grants or cooperative agreements are subject to the IMLS General Terms and Conditions for IMLS Discretionary Grant and Cooperative Agreement Awards and the IMLS Assurances and Certifications. Organizations that receive IMLS funding must be familiar with these requirements and comply with applicable law. As an applicant for Federal funds, you must certify that you are responsible for complying with certain nondiscrimination, debarment and suspension, drug-free workplace, and lobbying laws. These are set out in more detail, along with other requirements, in the Assurances and Certifications. By signing the application form, which includes the Assurances and Certifications, you certify that you are in compliance with these requirements and that you will maintain records and submit any reports that are necessary to ensure compliance. Your failure to comply with these statutory and regulatory requirements may result in the suspension or termination of your award and require you to return funds to the government. F3. What are the reporting requirements? At a minimum, you will be required to submit a performance report and financial report annually. Reports are due according to the reporting schedule that is part of your Official Award Notification for Grants and Cooperative Agreements. Grantees must submit reports electronically using the IMLS performance and financial report forms. In support of the agency’s commitment to open government, interim and final performance reports may be made accessible on the IMLS website to engage the public. You must also comply with 2 C.F.R. §§ 180.335 and 180.350 and 2 C.F.R. pt. 3185 with respect to providing information regarding all debarment, suspension, and related offenses information, as applicable. F3a. What do we need to know if the Federal share of our award is more than $500,000 over the period of performance? If the Federal share of your award is more than $500,000 over the period of performance, you should refer to the post-award reporting requirements reflected in 2 C.F.R. pt. 200, Appendix XII – Award Term and Condition for Recipient Integrity and Performance Matters. G1. Who should we contact if we have questions? Click here for IMLS staff contact information for this program [external link to appropriate program landing page]. IMLS staff are available by phone and email to answer programmatic and administrative questions relating to this grant program. G2. How can we participate in a webinar for this IMLS funding opportunity? H1. What do we need to know about acknowledging IMLS support? Grantees must include an acknowledgement of IMLS support in all grant products, publications, websites, and presentations developed with IMLS funding. All work products should reference IMLS and include the associated grant award numbers. Click here for the Grantee Communications Kit, which provides guidance for fulfilling these requirements. H2. What should we do if we are including confidential or proprietary information in our application? IMLS may share grant applications, work products, and reports with grantees, potential grantees, and the general public to further the mission of the agency and the development of museum, library, and information services. These materials may be disseminated broadly and made available in a variety of ways and formats. For the above reasons, you should not include in your application any information that you consider to be confidential or proprietary. However, if you do decide to provide information that you consider confidential or proprietary, you must clearly identify it as such. IMLS will handle confidential and proprietary information in accordance with applicable law (e.g., Freedom of Information Act [FOIA], Privacy Act). H3. What do we need to know about sharing and copyright of IMLS-supported work products and managing digital products? H4. What conflict of interest requirements must we follow? H5. Where else can we find additional information about IMLS? You can check the IMLS website for information on IMLS and IMLS activities. H6. Is IMLS obligated to make an award as a result of this announcement? IMLS is not obligated to make any Federal award or commitment as a result of this announcement. H7. How can I become a peer reviewer? If you are interested in serving as a peer reviewer, you may enter your contact information, identify your experience and expertise, and upload your resume through our online reviewer application at www.imls.gov/grants/become-reviewer. If you are identified as a potential reviewer, we will notify you by email prior to the next review period to confirm your availability. H8. How long should it take us to complete an application? Send comments regarding this burden estimate or any other aspect of this collection of information, including suggestions for reducing this burden, to the Institute of Museum and Library Services at 955 L’Enfant Plaza North, SW, Suite 4000, Washington, DC, 20024-2135, and to the Office of Management and Budget, Paperwork Reduction Project (3137-0091), Washington, DC, 20503. As a Federal agency, IMLS is required to obtain from all applicants certifications, including those regarding Nondiscrimination, Debarment and Suspension, Federal Debt Status, and Drug-Free Workplace. Applicants requesting more than $100,000 in grant funds must also certify regarding lobbying activities and may be required to submit a “Disclosure of Lobbying Activities” form (Standard Form LLL). Some applicants will be required to certify that they will comply with other federal statutes that pertain to their particular situation. These requirements are incorporated in the Assurances Statement below. The authorized representative must review the statement and provide the certification in item 9 on the SF-424S. By signing the application form, the authorized representative, on behalf of the applicant, assures and certifies that, should a Federal award be made, the applicant will comply with the statutes outlined below and all related IMLS regulations (for example, see 2 C.F.R. ch. XXXI and 45 C.F.R. ch. XI). These assurances are given in connection with any and all financial assistance from IMLS after the date this form is signed, but may include payments after this date for financial assistance approved prior to this date. These assurances shall obligate the applicant for the period during which the federal financial assistance is extended. The applicant recognizes and agrees that any such assistance will be extended in reliance on the representations and agreements made in these assurances, and that the United States Government has the right to seek judicial enforcement of these assurances, which are binding on the applicant, its successors, transferees, and assignees, and on the authorized representative whose signature appears on the application form. The authorized representative, on behalf of the applicant, certifies, as a condition of the award, that the applicant will or will continue to provide a drug-free workplace by complying with the requirements in 2 C.F.R. pt. 3186 (Requirements for Drug-Free Workplace (Financial Assistance)). In particular, you as the recipient must comply with drug-free workplace requirements in subpart B (or subpart C, if the recipient is an individual) of 2 C.F.R. pt. 3186, which adopts the Government wide implementation (2 C.F.R. pt. 182) of sec. 5152-5158 of the Drug-Free Workplace Act of 1988 (Pub. L. 100-690, Title V, Subtitle D; 41 U.S.C. §§ 701–707). The authorized representative, on behalf of the applicant, certifies that the applicant will assist the awarding agency in ensuring compliance with Section 106 of the National Historic Preservation Act of 1966, as amended (16 U.S.C. § 470f, see 54 U.S.C. § 306108), Exec. Order No. 11,593, and the Archaeological and Historic Preservation Act of 1974 (16 U.S.C. § 469 et seq., see 54 U.S.C. § 501502 et seq.). protection of endangered species under the Endangered Species Act of 1973, as amended (16 U.S.C. § 1531–1543). The authorized representative, on behalf of the applicant, certifies that the applicant will comply with the flood insurance purchase requirements of the Flood Disaster Protection Act of 1973, as amended (42 U.S.C. § 4001 et seq. ), which requires recipients in a special flood hazard area to participate in the program and to purchase flood insurance if the total cost of insurable construction and acquisition is $10,000 or more, or as otherwise designated. All non-federal entities are required to have a Dun and Bradstreet Data Universal Numbering System (D-U-N-S®) number (a unique entity identifier) in order to apply for, receive, and report on federal awards. The System for Award Management (SAM) is a federal repository that centralizes information about grant applicants and recipients. You must be registered with SAM.gov before you register with Grants.gov. Click here to find information about registering with SAM.gov. Click here to learn more about Grants.gov resources, which include checklists, FAQs, and online tutorials to assist you in preparing your organization to submit applications. On the IMLS Program Information Sheet, you selected an IMLS agency-level goal of Learning or Community or Content and Collections with which your project best aligns. You also selected at least one performance goal that reflects a measurable change or outcome that you intend for your project to achieve. Below is a list of pre-determined performance measure statements that will help IMLS document the collective achievements of the Learning and Community projects we fund. The SF-424S is the “Application for Federal Domestic Assistance/Short Organizational Form,” which is part of the application package that you downloaded from Grants.gov. Legal Name: Enter your organization’s legal name as it appears in your SAM.gov registration. This is the organization with the authority to apply directly for funding in this program. If you have an organizational unit that will be carrying out the project, be sure that it is specified as the organizational unit on the IMLS Program Information Sheet. Address: Enter your legal applicant’s address as it appears in your SAM.gov registration. Web Address: Enter your web address. Type of Applicant: Select the code that best characterizes your organization from the menu in the first dropdown box. Leave the other boxes blank. Employer/Taxpayer Identification Number (EIN/TIN): Enter the EIN or TIN assigned to your organization by the Internal Revenue Service. Organizational DUNS: Enter your organization’s D-U-N-S® number received from Dun and Bradstreet. Project Title: Enter a brief descriptive title for your project. IMLS may use this title for public information purposes. Project Description: Enter a brief description (about 120 words) of your project. Tell us what your project will do, for whom or what, and why. Use clear language that can be understood by readers who might not be familiar with the discipline or subject area. Proposed Project Start Date/End Date: Enter the start date and end date of the proposed period of performance in the format mm/dd/yyyy. The project period begins on the first day of the month in which project activities start and ends on the last day of the month in which these activities are completed. Refer to Section B of this Notice of Funding Opportunity to determine when your project can begin. The Project Director is the person who will have primary responsibility for carrying out your project’s activities. Enter the requested information for this individual here. The Primary Contact/Grants Administrator is the person who has primary responsibility for administering the award. Enter the requested information for this individual here. If the Primary Contact/Grants Administrator is the same as the Authorized Representative, please still complete both Items 8 and 9. The Authorized Representative is the person who has the authority to legally bind your organization. Enter the requested information for this individual here. The Authorized Representative cannot be the same person as the Project Director. By checking the “I Agree” box at the top of Item 9, this individual certifies the applicant’s compliance with the IMLS Assurances and Certifications and any other relevant federal requirements. Submission of the electronic application acknowledges that your organization certifies compliance with relevant federal requirements, including but not limited to the IMLS Assurances and Certifications to the same extent as the signature does on a paper application. Legal Name: From 5a on the SF-424S, same as SAM.gov registration. Organizational D-U-N-S ® Number: From 5f pm the SF-424S. Organizational Financial Information: a-d. All applicants must provide the information requested. Grant Program: Make one selection in each category: 3.a.1 (funding category), 3.a.2 (project type), and 3.a.3 (project category). Performance Goals: Select one of the three IMLS agency-level goals (a – c). Check at least one of the performance goals listed beneath it. Note: If you select a performance goal(s) under agency-level goals a) Learning or b) Community, click on the link below it to review the specific performance measure statement choices and the information you will be required to collect and report on throughout the award period of performance: Performance Measure Statements and Information to be Collected and Reported for Learning and Community Projects. Cost share amount: If your proposal includes cost share, enter the amount of non-federal funding you are providing. See Section C.2 for cost share requirements. Population Served: Check the boxes that reflect the population(s) to be served by your project. Museum Profile: Skip this section. Project Elements: Skip this section. The Schedule of Completion should reflect each major activity identified in your application Narrative and the project dates identified on the SF-424S and IMLS Budget Form. It should show when each major project activity will start and end. 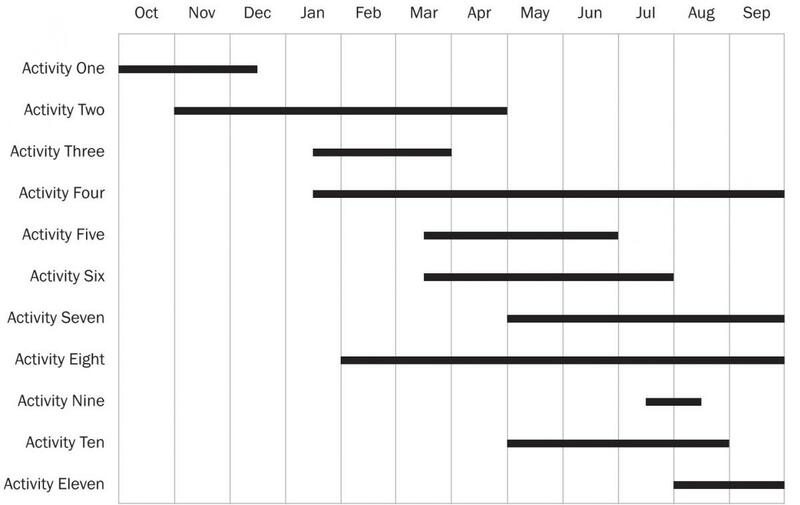 The schedule should be no longer than one page per project year. See the sample schedule of completion below. Download the IMLS Budget Form (PDF, 110 KB). 2. Fringe Benefits: Fringe benefits can only be claimed as a direct cost for those positions included in your direct cost pool. Fringe benefits may be claimed only on the portion of Salaries and Wages identified for this project. 3. Travel: Explain the method of cost computation for each travel cost, including subsistence, lodging, and transportation, in your Budget Justification. 5. Contracts and Subawards: List each third party that will undertake project activities and their associated costs as an individual line item on your budget form. Designate each third party as either a contract or subaward using the drop-down menu on each line. 7. Other Costs: Use this section for costs that cannot be assigned to other categories. Do not use this section to list items that do not fit in the lines allotted for another section. Write a budget justification and save it as a PDF. Your Budget Justification should address both grant funds and cost share and align with your IMLS Budget Form. It should identify the purpose for each expense and show the method of cost computation used to determine each dollar amount, including any that you may have consolidated and summarized on the IMLS Budget Form. Follow the format of the IMLS Budget Form’s section headings. List the costs of project activities to be undertaken by third parties for the project. (Familiar terms for third parties can include partners, consultants, subgrantees, collaborators, vendors, or service providers.) Identify each third party by name, describe their role in the project, the activities they will carry out, and the cost. For each entry, designate the third party as either a subrecipient or a contractor. Explain costs for third parties and provide relevant supporting documents with your application. IMLS grant funds may generally not be provided to other U.S. government agencies. Federally negotiated indirect cost rates are negotiated agreements between federal agencies and non-federal entities. If your organization already has an existing negotiated indirect cost rate in effect with another federal agency, you may use this rate to calculate total project costs, as long as you apply the rate in accordance with the terms of the negotiated agreement and include a copy of the current negotiated agreement with your grant application. You may also choose to use a rate lower than your current federally negotiated indirect cost rate. We will only accept federally negotiated indirect cost rates that are current by the award date. Except for those non-federal entities described in Appendix VII to 2 C.F.R. pt. 200, you may choose to charge a rate not to exceed 10% of modified total direct costs (MTDC), as long you have never had a federally negotiated indirect cost rate and you meet the applicable requirements. See 2 C.F.R. part 200, including 2 CFR sections 200.68, 200.414(f), and 200.510(b)(6), for additional guidance. Modified total direct costs are direct salaries and wages, applicable fringe benefits, materials and supplies, services, travel, and up to the first $25,000 of each sub-award. MTDC excludes several cost categories, including equipment, rental costs, tuition remission, scholarships and fellowships, participant support costs, and the portion of each subaward in excess of $25,000. See 2 C.F.R. § 200.68 for additional information. If you are using the 10% indirect cost rate, check the box indicated on the IMLS Budget Form. No additional documentation is required. IMLS is committed to expanding public access to federally funded research, data, and other digital products. The assets you create with IMLS funding require careful stewardship to protect and enhance their value, and they should be freely and readily available for use and re-use by libraries, archives, museums, and the public. However, applying these principles to the development and management of digital products is not always straightforward. We require that you follow the directions addressing specific aspects of creating and managing digital products in the Digital Product Form. Download the Digital Product Form (PDF, 45 KB; Word 27 KB) here. An effective research application should answer the following questions in the project narrative. Discuss how your proposed work builds on existing projects or efforts, including those funded by IMLS. Provide information about how your research can lead to improved museum or library practice and demonstrate you are familiar with current scholarship, including empirical work, in your area of interest. Explain how you will manage, share, preserve, and document the information and research products you will create during the project. To do this, complete the Digital Product Form (PDF 475KB) and include it as part of the application to IMLS. Data sharing is an essential component of research and expedites the translation of research results into new knowledge and practices. If your project involves the collection and analysis of data, we expect you to include, as part of your application, a data management plan (Part IV of the Digital Product Form (PDF 475KB) that provides for long-term preservation and access. We expect you to deposit data resulting from IMLS-funded research in a broadly accessible repository that allows the public to use the data without charge no later than the date upon which you submit your final report to IMLS. The data should be deposited in a machine-readable, non-proprietary digital format to maximize search, retrieval, and analysis. For the purposes of this section, “data” is defined consistent with OMB guidance (please see 2 C.F.R. § 200.315). We reserve a royalty-free, nonexclusive, and irrevocable right to: (1) obtain, reproduce, publish or otherwise use the data first produced under a grant; and (2) authorize others to receive, reproduce, publish, or otherwise use such data for federal purposes. You may copyright any work that is subject to copyright and was developed under an award or for which ownership was purchased. However, we reserve, for federal government purposes, a royalty-free, nonexclusive, and irrevocable right to reproduce, publish, or otherwise use the work and authorize others to reproduce, publish, or otherwise use the work. We encourage you to make your works produced with IMLS support widely available, including through the use of open licenses. IMLS is committed to expanding public access to federally funded digital products (i.e., digital content, resources, assets, software, and datasets). We require that you follow the directions addressing specific aspects of creating and managing digital products in the Digital Product Form. The form provides additional instructions and guidance. Click here to access the Digital Product Form (45 KB).